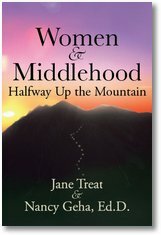 Jane Treat, the author of a new book called "Women & Middlehood - Halfway Up the Mountain", sent me news about the book. Of interest to Renee fans is that Jane has Renee's story "To The Roof Of Africa" as the lead story and provides the image on the cover of the book. Renee's mother, Sandra Wilson, also added a new ending to the story from her perspective. Renee` and her mother, Sandra, had planned the vacation of a lifetime. Africa! After a visit to Egypt, they traveled to northeast Tanzania to climb Mt. Kilimanjaro, the highest mountain in all of Africa – 19,340 feet. Even though it is only 3 degrees from the Equator, Kilimanjaro is so high that its snow-covered summit is often lost in the clouds. The book is called: Women and Middlehood: Halfway Up the Mountain and the website is www.middlehood.com.